Ever thanked the elevator? You know, that little moving room that takes you from one floor to another? We’ve all had the solitary elevator ride, and as euphoric as it is to dance around with your eyes closed as you move ever upward, a certain magic befalls an elevator full of people. If you live in a Creighton University residence hall, I’ll assume you’ve ridden your hall’s elevator up and down to your heart’s delight. As you should, for the elevator is vastly underappreciated in the community-forming hot spots we call residence halls. Laura Jablonski is my name, appreciating seemingly commonplace things in our world is my game. My junior year is upon me as I continue to voraciously study marketing and social entrepreneurship. Coincidentally, I live next to an elevator on the fifth floor of Kiewit Hall on Creighton’s campus. The tender sounds from the elevator doors as they open and close are not so charming whilst trying to sleep, but my love for this transporting contraption endures. With every open of the elevator doors and entry into that movable chamber comes a great opportunity. 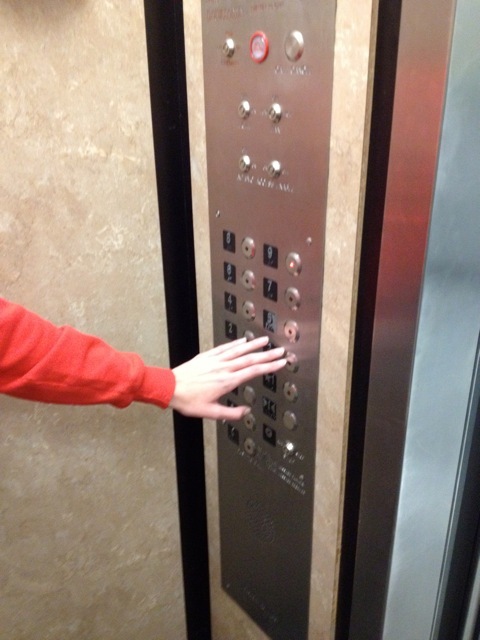 Not only do you possess the power to operate sophisticated machinery with the touch of a button, but you’re also granted the lucky chance to connect with your fellow elevator travelers. A unique breed, elevator travelers find themselves suddenly fascinated by the monochrome wall coverings as they ponder their destination, drawing nearer by the second. Now is your chance. Think of the possibilities: What did you learn in school today? Is that your natural hair color? Wow, you just exude health and happiness—you must do yoga! You get the picture. I think we can all recount positive, memorable elevator rides that left us happier when we left than we hopped on. The length of such an elevator ride is perfect for light-hearted introductions and conversations. Think of the elevator as a true ride, typical of an amusement park or traveling carnival. Entertaining, brief, and oh so exhilarating. Out of all the elevators in the world, this group of people gathered in this one at this particular point in time. Together you will make the journey toward a destination, and onto another destination. We are one community, laughing, connecting, and traveling in this thing together.